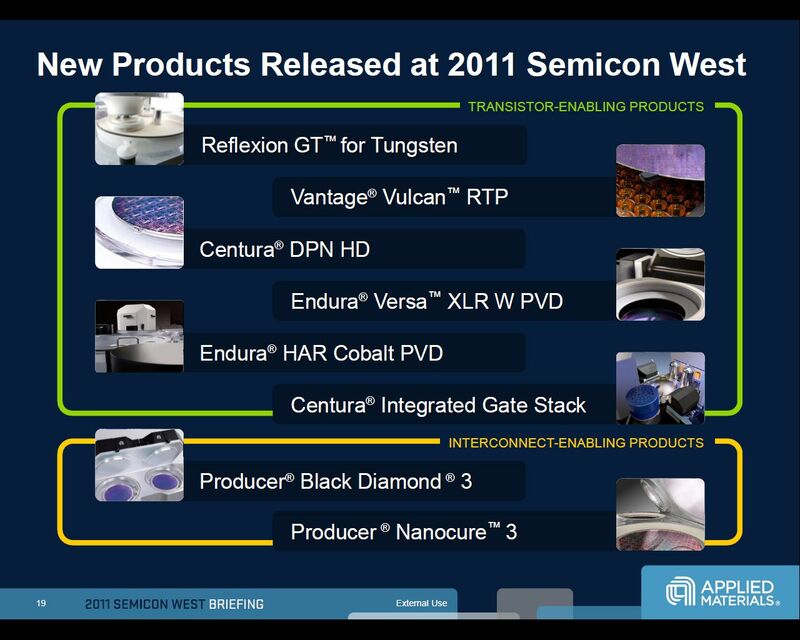 SEMICON West is usually taken as a barometer for the industry, and my subjective impression is steaming along nicely, but no record breaking years coming up! According to Tom Morrow of SEMI, this year’s preregistrations were flat, but there about 10% more booths than last year. I kicked off the show by sitting in at the Applied Materials (AMAT) press and analysts breakfast. As usual AMAT had a flurry of press releases preceding the show, and eight new products and product updates are being launched. A couple of years ago AMAT was putting more emphasis on their solar and display divisions, but this year silicon processing is again getting a high profile. We had a series of presentations from Mike Splinter, Randhir Thakur, Steve Ghanayem, and Bill McClintock, and then Q-and-A from the analysts present. Mike S. did the corporate overview: he saw the industry outlook as soft in the short term, but was basically upbeat since the industry drivers are still there — Moore’s law scaling, 3D transistors (in logic, flash and DRAM), and pushing them all, the mobile revolution. On the solar side, he predicted that solar modules will cross the $1/Watt threshold sometime this year, and hit $0.80/W next year, so cost reductions will help drive that end of the business. 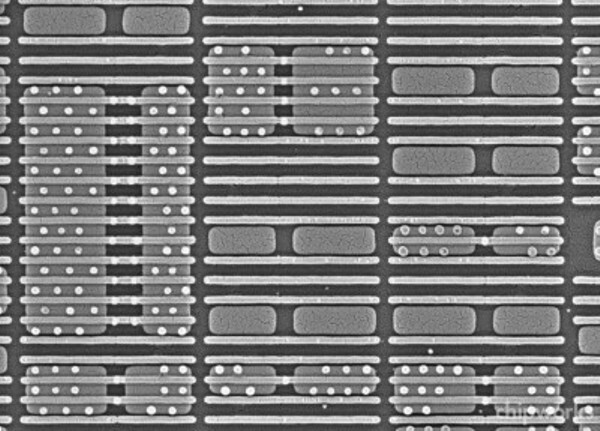 He put a lot of emphasis on the cluster nature of the tool, so that the wafers only see vacuum between the process steps, claiming that exposure to atmosphere reduces mobility and increases threshold voltage spread. The last technical presentation (Bill McClintock) covered off the new Black Diamond 3 (BD3) and Nanocure 3 extreme low-k dielectric and curing combination, giving a dielectric constant (k) of 2.2, down from k=2.5 in the previous generation. 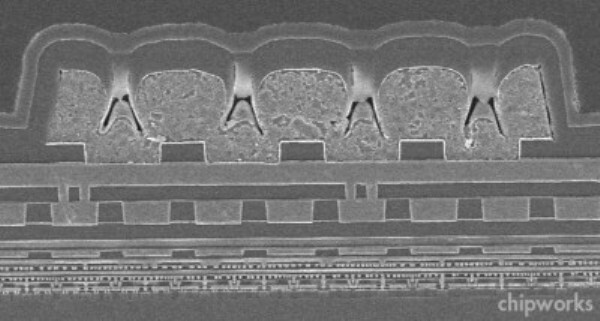 One of the things he pointed out (that I hadn’t thought about) was that the pre-metal dielectric layer at the bottom of the metal stack has to survive more than 150 process steps before wafer out in today’s 10-12 metal-layer processes, never mind the stresses of the packaging and assembly sequence. So the challenges are formidable as the k-value is pushed down, to get both physical and material integrity; AMAT claims that by going to a closed-pore structure, with tighter pore size distribution, they can achieve k=2.2. 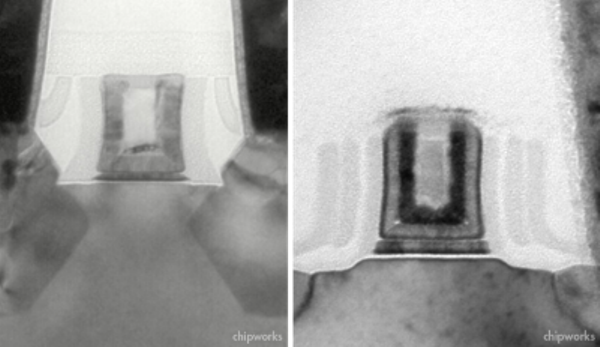 According to Bill, we can expect to see BD3 at the 22/15 nm nodes, so a couple of years yet before we see it in high-volume products. Then we got to the Q-and-A session. Ironically, the first question was not about any of the product launches — it was about the spend on 450mm next year! Mike Splinter was reluctant to give a specific number, but he did say it would be "well over $100 million," mostly on early test systems in-house. Not exactly small change, all the same. A later question prompted the statements that "450 is going to happen," and that they are closely linked to the leading customers that will drive the move there. They are clearly now viewing 450mm as a strategic way of gaining market share when it does come. Other questions covered off potential product expansion, and of course the future demand from foundries in what seems to be a softening market. Randhir Thakur identified AMAT’s flowable CVD, Siconi clean and the Raider copper deposition tools as having found more applications than originally intended. The flowable CVD was targeted on one application, but ended up replacing CVD fill for STI, and other CVD steps with high conformality requirements. Siconi clean has evolved from a PVD clean, but has now moved into CVD and epi areas, any area where interfaces are critical. The Raider copper tool was developed from a Semitool product for packaging, but now has potential for damascene copper on die. When it comes to the foundries, it appears that the fab shells are ready, and the message for the equipment companies is to be ready — things may be soft at the moment, but they could come back very quickly. Demand is controlled by the consumer market, and that has proved remarkably resilient considering some of the economic challenges in the last year or so. All in all, an interesting session, both in the industry and technical senses. AMAT has the webcasts and presentations up on their investor website for until August 12, 2011. 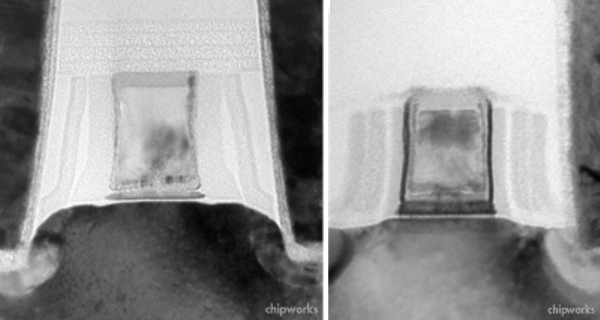 You are currently browsing the Chipworks blog archives for July, 2011.